Place egg in a shallow dish and beat; gently stir in sliced okra. Combine cornmeal and flour in a gallon-size resealable plastic bag. Drop 5 slices of okra in the cornmeal mixture, zip the bag, and shake. 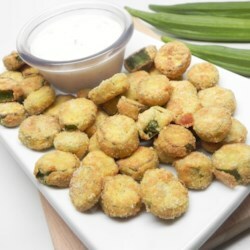 Remove breaded okra to a plate. Repeat with remaining okra slices. Preheat air fryer to 400 degrees F (200 degrees C). Place 1/2 the breaded okra slices in the basket of the air fryer and spray with cooking spray. Cook 4 minutes. Shake the basket and mist okra with cooking spray again. Cook an additional 4 minutes. Shake the basket one last time and cook for 2 minutes. Remove the okra from the basket and salt to taste. Repeat with remaining okra slices.